Soggiorno Primavera i Firenze, Italien: Reservér nu! 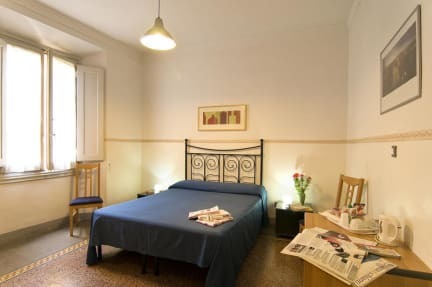 Our B&B guesthouse Soggiorno Primavera is located in the center of Florence. It is very close to central train station but far enough away to be quiet at night that you can sleep comfortably in our large , sunny and clean rooms, recently renovated. We offer you rooms for 1 or 2 or 3 persons and a family room for 4 and 5. All the rooms have a shared bathroom; one double room has a private bathroom inside. Please note this: the 'standard double room shared bathroom' has two twins bed; if you prefer to have a queen size bed let us know it before your arrival please. You can also park your car easily on the street in front of the building, on the blue lines which cost 1,60E per hours from 8a.m. til 8p.m. during the night and on the holidays they are free), and the bus stop is near the hotel. Check-in 9 am./1 pm. ; 3,30pm/6pm. On saturday and sunday and all the month of august the check in time is from 9 a.m. till 2 pm. Very important: if you are not able to arrive during these hours please get in touch with us so we can fix an appointment for your check in. 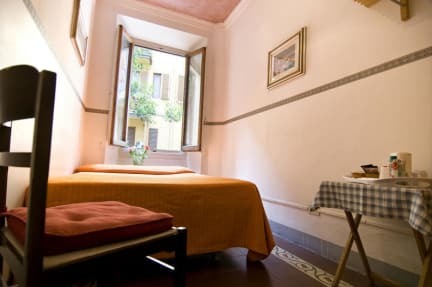 All the guests have to pay the city tax; in our B&B it is 3E er person per night and it is not included in the room rate.